Rubble Rush a mobile game built by myself and 3 other team mates during the Great Canadian Appathon 48-hour competition, from a concept idea I had come up with. 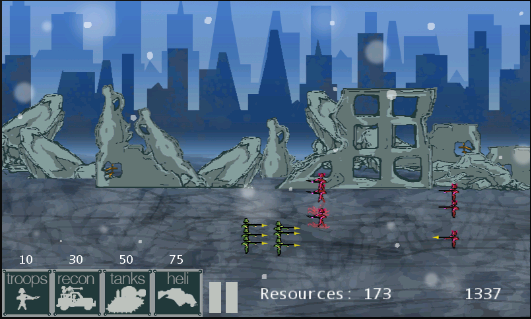 Rubble Rush was a side scrolling game war game where you could spawn foot soldiers, tanks, or helicopters to help fight against the enemy army. It was built in 48 hours, with very little sleep. Rubble Rush was programmed in C# using the XNA framework. Although the game was never fully completed (you can only do so much in 48 hours), our game placed in the top 25 games out of 149. My role on the team was lead programmer and project manager for the game.